#20- Branstad’s campaign pulled a dirty trick by creating a fake Jack Hatch website. #19- Branstad actually hosted the Family Research Council’s “hate fest” in Ames earlier this year. #18- At a Texas fundraiser Branstad admitted support for “tort reform”. #17- In an insult to the principle of the separation of church and state, Branstad was an active participant and signed a state declaration for Bob Vander Plaats’s “Day of Prayer and Fasting”. #16- The renovations at the Iowa Veterans Home are mired in controversy. #15- Branstad’s Administration gave up a $1 million solar grant. #14- His corporate tax cut will leave cities and counties short of funds. #12- With our roads and bridges falling apart, Branstad has shown zero leadership on raising the gas tax. #11- Branstad has cost the taxpayers over $500,000 in legal fees in trying to unfairly get rid of Christopher Godfrey. #10- Branstad illegally closed the Iowa Juvenile Home in Toledo. 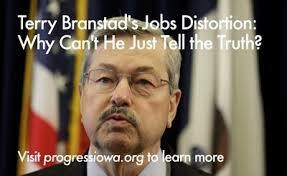 #9- Branstad illegally closed 36 unemployment offices at the height of the Great Recession. #8- Iowa’s water pollution and soil erosion are still a huge problem. #7- Branstad’s Administration took the Chief Administative Law Judge’s position and made it susceptible to political pressure from the Governor’s office. #6- Branstad still has close ties to the American Legislative Exchange Council. #5- Branstad has failed to cut the cost of state government. According to a study reported in the 8/31/14 Des Moines Register, state spending has gone up 17.5%. #4- Another one of Branstad’s big goals was to create 200,000 jobs. So far the net number of jobs created since 2011 is around 74,000. #3- Another big Branstad goal was to increase Iowa family incomes by 25%. Here was another miserable failure. According to the same Register study incomes have gone up just 0.17%. #2- Branstad packed the Iowa Board of Medicine with people that did away with Planned Parenthood’s telemedicine arrangement. #1- Instead of expanding Medicare, Branstad tried to push through a vastly inferior health insurance plan called the “Healthy Iowa Plan”. #0- A state auditor report has found there have been 42 settlement agreements by this Administration totaling $2.4 million dollars. These reasons should give everyone pause about re-electing Terry Branstad. Another reason may be his health. At the first debate, Branstad’s shaking hands and erratic behavior was plainly evident. Does he have Parkinson’s disease or something like that? The rumors persist that if re-elected Branstad will step down after a time and allow the incredibly average Kim Reynolds to become governor without having to go through an election. This entry was posted in 2014 Election Campaign, Blog for Iowa, Branstad, Economy, Environment, Food Insecurity, Guest Posts, Jobs, separation of church and state, womens rights and tagged Branstad scandals. Bookmark the permalink. 21. Sent out Estate Recovery Notices to former Iowacare recipients at the last minute, (March 5, 2014) to scare them, and others away from enrolling in the ACA,… having his office and his Health and Human Services Director (appointed by him) tell these same people, a LIE, to folks previous to this notice, from October 1, 2013 to March 17 about Estate Recovery!! 14,000 Iowans (55 to 64) and incoming people, of age 54 were sent these, one page, no explanation, scare letters. Other States have waived this provision for Medicaid Expansion (Law of 1993 for Long Term Care) but not Branstad. Just HOW do you put in a claim against someone’s property when the PROVIDER (UIHC) covered the bulk of it through charitable contributions????? This is NOT long-term care in a nursing home!!!! I have been mentioning the Parkinson’s thing for a few years, to no avail. I almost literally ran into TB at the 4th/July concert in DSM the year before he ran the second time and noticed it then. (I was biking, he almost walked into me.) I think Hatch has taken a chicken-bleep approach to this campaign. If it were me, I’d have said, ‘I’ll show you my tax records if we can see your medical history.’ Earlier this week, in a presser, he talked slow, slurred, his eyes were puffy – looked closed in fact – and he never let go of the podium. Where in the (bleep) is “The Newspaper Iowa Depends On” through this whole matter. Kim Reynolds, now there’s wasteful gubmint spending. You can Google ‘kim reynolds standing behind terry branstad’ and get a ton of pics. Has she done ANYthing else? Why not publish this in a Letter to the Editor (comments and all) to the Des Moines Register..and see if they publish it. If they’re “The Newspaper Iowa Depends On” they will make sure all the facts are out there for the Iowa Voter. And while you’re at it, you might want to contact the local Des Moines television stations, such as, WHO, WOI, and KCCI, concerning Governor Branstad’s health records and revealing them. How about the, $50,000 a year, pension, he’s receiving, on top of his present salary. I could live for about 4 years on that pension, alone. If Hatch won’t bring these issues to light, I’m willing to bet, that thousands of Iowans, would be happy to have Branstad exposed. Branstad and his wife own 13 post office buildings around the state and collected over $81,000 in rent last year. This sure seems to be a conflict of interest. Maybe some incentive for the big push to drastically lower business building taxes that put the state in the red.